In this article we will describe how we created the calendar in our back-office management application EK (see demo). 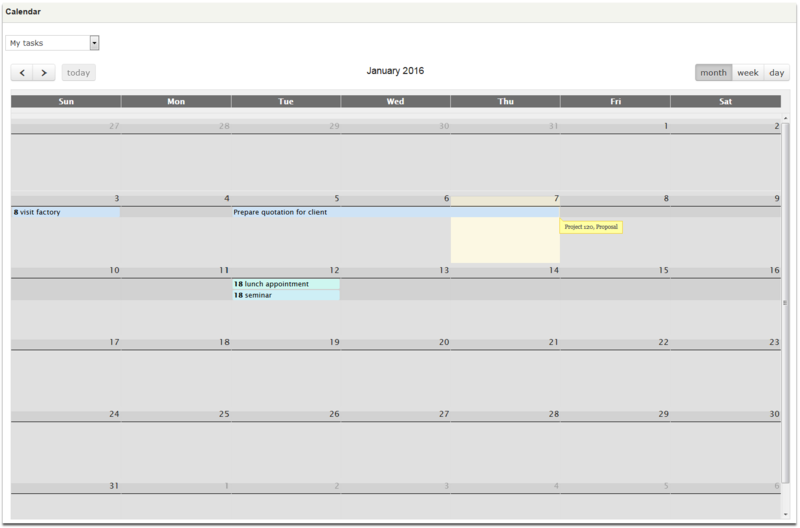 For this function, we used the FullCalendar plugin and its dependencies. Note: we also used jQuery qtip to display title pop-up in the calendar, but this not an obligation. In MyModule.routing.yml we will need 2 routes. The first one is the main route to the calendar display function in our countroller; the second one is to pull data displayed in the calendar from an ajax call. The id in MyModule_calendar_view route is a key used to indentify the type of data to be retrieved. In our case we display different events from dates of projects status and tasks thus we filter base on event type in our controller (submission, start, deadline, etc...). But this can be adapted to your own case. This form is very simple and used to filter the events and trigger the calendar display. 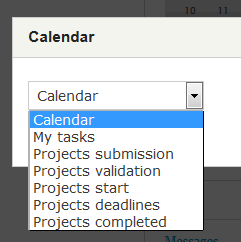 calendar() function is very basic as it only call the dialog box. * Render dialog in ajax callback. * (optional) TRUE if modal, FALSE if plain dialog. Defaults to FALSE. * An ajax response object. The view() function is where the customisation part is the most relevant. This function collect data to display in a database and send them back in appropriate format. Thus we will only show the basic structure as it may apply to multiple data sources or formats. 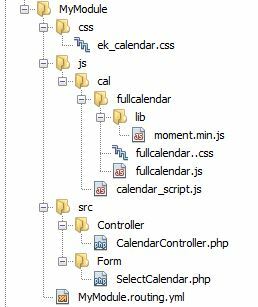 What happen here is that the function display_calendar() which actually trigger the fullCalendar plugin action is bind to the form that filters the data and identified by its id '#filtercalendar'. This function simply call fullCalendar with necessary options (including the events that are pulled from view()) and display it into the html div markup identified by its id '#calendar'. Feel free to comment or suggest other ways of creating a calendar. Sorry, being short of time, we haven't provided a fully working source files.